The warning from the hotel was clear: make more noise and you’re getting shut down. As a result, a group of fighting game fans who gathered in a hotel suite this past weekend to battle each other had to figure out how to have a good time in the most hushed tones possible. The result sounded less like a fighting game party and more like a poetry reading. Instead of cheering at amazing plays, the attending crowd snapped their fingers. “We got the noise complaint around 12:30 AM when the stream had been hot for about 20 minutes,” explained Dan “Raidhyn” Nichols, who is helping create the Smash Bros.-style game Brawlhalla. He and a colleague were staying at a Marriott hotel for the weekend’s big Final Round 20 tournament in Atlanta and had decided to open up their suite on Saturday night to players who wanted to compete after-hours. Nichols said some 200 players came and went. With setups for Street Fighter V, BlazBlue: Central Fiction, and Pokkén Tournament, not to mention appearances by top-notch players like Darryl “Snake Eyez” Lewis and Jachin “SKD” Harte, people were most certainly having a good time. But in the fighting game community, good times are often accompanied by a good deal of shouting and screaming. Although the hotel was willing to work with the fighting game players and not kick them out, their acquiescence came with one caveat: one more noise complaint would result in an immediate end to the festivities. 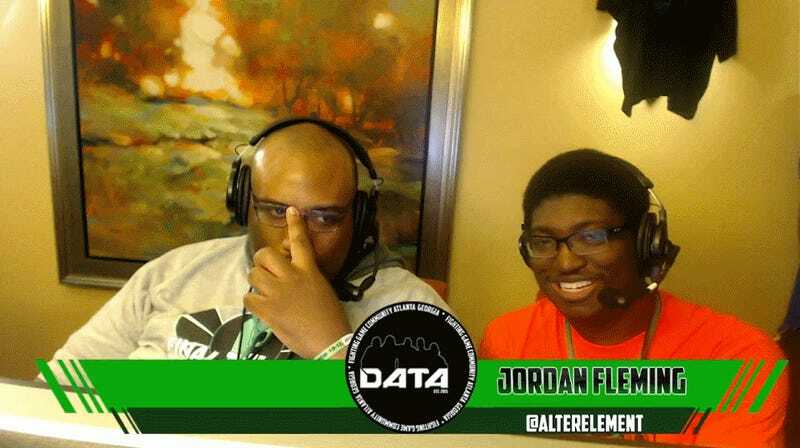 As things were just beginning to ramp up, attendees (many of them part of the Atlanta-based DATA FGC broadcast team) were quick to hush their fellow competitors if things got too rambunctious. In-suite video following that warning is amusingly low-key. Instead of clapping for good plays, the crowd cheers by snapping their fingers. High-energy situations were met with a chorus of shushes to ensure things didn’t get out of hand. Commentators put on their best golf announcer voices for the calmer atmosphere. And while this may seem strange for anyone familiar with a typical fighting game event, the folks in attendance were still having fun. Nichols said it remained that way for three hours after the initial complaint, and a follow-up visit from hotel staff wasn’t necessary all night. With the rise of streaming platforms like Twitch, these “salty suites” have become ubiquitous with the fighting game community. They’re often the best place to see grudge matches that couldn’t be settled during the normal tournament put to rest, and they also provide a space of camaraderie for players of all skill levels to engage in friendly matches with some of the world’s strongest competitors. A hotel room is hardly the best place to put on such an exciting event, but as this story proves, the fighting game community is resourceful.